This post on Sally Hansen Airbrush Legs contains affiliate links meaning purchases made through included links may result in Splendry earning a small commission at no cost to you. There are the products you try and like, and then there are the products you try and love. I recently tried Sally Hansen Airbrush Legs leg makeup (even though it’s been around for a long time!) and can’t believe I haven’t tried it sooner. Sally Hansen Airbrush Legs is one of those products on my love list. 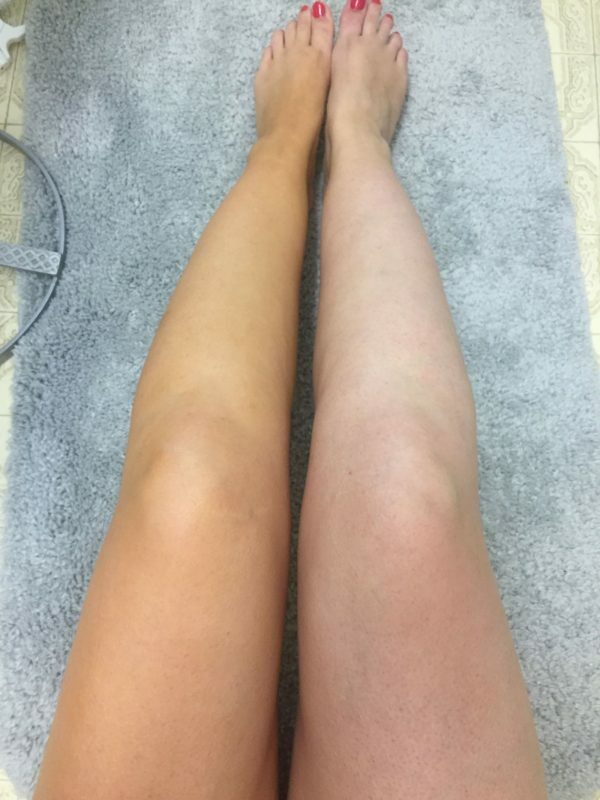 As someone who is very fair-skinned and has tried her fair share of self tanning products I have never had a product give me such incredible results! I recently attended a dressy event and as I was getting dressed remembered I had a travel size bottle of Sally Hansen Airbrush Legs that I had received in a subscription box. I thought I’d give it a try (plus I had plenty of time to wash it off if it didn’t work right!). First of all as I squeezed this into my hand I thought there was NO WAY this would go well. It looked really dark (I was using the Medium shade) and also like it wasn’t nearly enough to cover one whole leg! I could not have been more wrong! It was so even, so smooth and so fast that it didn’t even seem possible it was this easy! But what if it rained? Would brown streaks be running down my legs? After I finished applying the lotion to both legs I put my hands under the faucet and the lotion didn’t smudge, smear or move! With some soap though it came right off! By the time I got home that night I climbed into bed without even thinking about the makeup on my legs and when I remembered the next morning I fully expected my white sheets to be streaked with leg makeup. Not a spot to be found! In fact, my legs looked so amazing still that I decided not to wash it off that day! I asked a few friends what they thought of my perfect-looking legs and all of them were amazed when I told them I was using leg makeup! It looked so natural most of them assumed I had just come back from a tropical vacation. While I never expected leg makeup to earn a permanent spot in my bathroom cabinet, it has and I can’t recommend it enough! Okay…..I really, really need to try this! I would have never thought this would work but I’m going to give it a whirl!! I’m excited!! Thanks for sharing! I love Sally Hansen Airbrush Legs! I’ve been using this for years! The best!